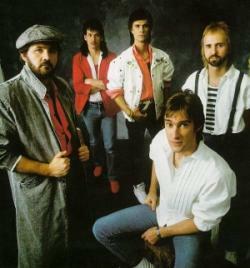 Petra is a music group regarded as a pioneer of the Christian rock and contemporary Christian music genres. Formed in 1972, the band took its name from the Greek word for "rock". Though they disbanded formally in 2006, incarnations of Petra have played reunion shows in the years since and released an album in November 2010. In 2013, the band returned from retirement with a new drummer Cristian Borneo and recorded a new song titled "Holy is Your Name", as well as going back on tour.